Pine cones and holly are beautiful reminders of winter. Here is an example of a Holiday Open House Invite from Anna Griffin available at Hyegraph Invitations & Calligraphy located at 3 Embarcadero Center, San Francisco CA. Anna Griffin Die Cut Holiday Open House Invitations in metallics with pine cones & holly This inviting design is in silver, gold, red and green metallics reminiscent of a snowy winter’s day. 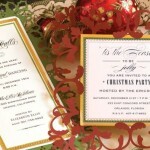 The custom printed invitation is adorned with gold pine cones, branches, red holly, and pretty white and red ribbon. The invitation is white with red and gold borders. 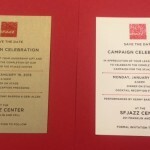 The price for this invite is $6.15 each or $184.50 for 30 cards.